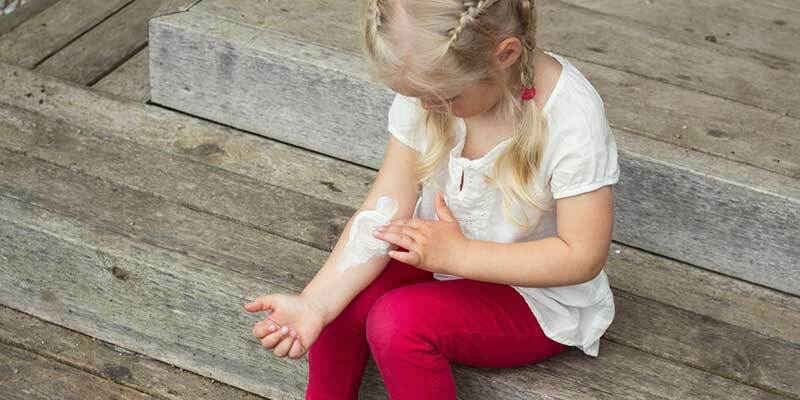 Eczema, or atopic dermatitis, is a common skin condition that affects children as well as adults. Although it can be difficult for anyone of any age to manage, eczema in children poses unique concerns. According to the National Eczema Association (NEA), 1 in 5 of the 9 million children in the U.S. with eczema experience some level of bullying because of their skin condition. If you are a parent of a child with eczema, it’s important to help your child establish healthy skincare habits now. They will follow him or her into adulthood and help to reduce or even eliminate the various psychological issues that can accompany chronic skin conditions like eczema. Here’s how you can help. Eczema is characterized by dry, flaky patches of skin that can appear anywhere on the body and face. These patches of skin may become very itchy, although scratching them can result in inflammation and infection (American Academy of Dermatology). When children have eczema, however, these physical symptoms are often accompanied by social stigmas that can lead to decreased self-confidence, happiness, and interest in hobbies and social activities. In fact, the NEA survey found that 77 percent of children who have been bullied because of their eczema have a lowered self-esteem, and 40 percent report that bullying has caused them to become disinterested in sports and other activities. Surprisingly, however, 40 percent of these children’s parents say that their kids are not interested in self-management of their skin condition, which may point to a lack of understanding of eczema. Not only do their children not fully understand eczema, but many parents find that neither do their children’s teachers and family physicians understand eczema (Dermatology Times). Part of helping your child and his or her teachers and other caretakers better understand and manage eczema is to not only address the physical symptoms, but to also learn to recognize signs of the emotional impact as well. Ask your child if he or she is having trouble at school or with classmates, and work with teachers and other parents to eliminate potential bullying problems. Moisturize throughout the day. If your child uses a prescription cream or ointment, talk to your dermatologist about getting an additional tube to keep at school or in his or her backpack. Make sure your child is using a barrier repair moisturizer. Avoid fragrances and harsh detergents. These ingredients can damage the skin barrier and worsen eczema. It can be helpful to discuss the bath and laundry products that you use for your child with your dermatologist to make sure these are not unknowingly contributing to his or her symptoms. Wear gloves at night to reduce scratching. During the day, teach your child to resist the urge to scratch. Your doctor can prescribe antihistamines or may recommend taking over-the-counter options to help minimize itching. Avoid scratchy fabrics like wool. These can irritate the skin and make itching worse. Follow a regular skincare routine. The best treatment for eczema is a consistent and proper skincare regimen. This should include a gentle non-foaming cleanser and barrier repair moisturizers that contain ingredients like ceramides, fatty acids, and cholesterol. Your doctor may also prescribe antimicrobial products to help lower bacteria levels on the skin in the event of an infection. If eczema is getting in the way of your child’s happiness and quality of life, work with his or her doctor and dermatologist to address both physical and emotional symptoms. Explain to your child the importance of taking great care of his or her skin to help get rid of itchiness and dry, flaky patches, which can, in turn, increase your child’s self-esteem, confidence, and social skills.